[M. lilifera], var. (W. W. Smith) Pampanini, Bull. Soc. Tosc. Ort. 41: 137, 1916) = M. wilsonii f. taliensis. [M. wilsonii], f. (W. W. Smith) Rehder, Manual Cult. Trees, Ed. 2, 249. 1940), basionym: M. taliensis (W. W. Smith, Notes Roy. Bot. Gard. Edinb. 8: 341. 1915). Type: Forrest 7182, Tali Range, Yunnan, China. syn. : M. lilifera var. taliensis (W. W. Smith) Pampanini, Bull. Soc. Tosc. Ort.41: 137 (1916). Probably = M. wilsonii f. nicholsoniana, which has priority of one year. [M. grandiflora], cv. (Le Bon Jardinier 1833: 734. 1833). nomen nudum. in Seringe, Fl. Jard. 3: 226 (1849), nomen nudum. in Pampanini, Bull. Soc. Tosc. Ort.41: 106 (1916), nomen nudum. [M. sprengeri], cv. (Otto Eisenhut nursery catalot, p. 6, 1989, Ticino, Switzerland). Nomen nudum. [M. acuminata subsp. subcordata], cv. (Niemetz, Mitt. Deutsch. Denor. Ges. 32: 225, 1922,), has not produced seeds. Probably = M. x thompsoniana. [M. x thompsoniana], cv. - the typical cultivar. [M. x soulangeana, M. x veitchii (? )], cv. (Otto Eisenhut Nursery Catalog, p.3, 1989, Ticino, Switzerland). Nomen nudum. [M. x soulangeana, M. x veitchii], cv. (Magnolia 20(1) [Issue 37]: 20, 1984). 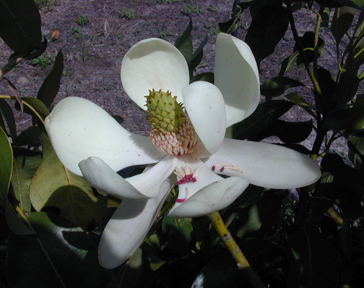 ‘A Gresham hybrid with huge pure white flowers 10 to 12 inches across, resembling M. campbellii; 9-12 broad tepals, with a small amount of pink at the base.’ Registered by Ken Durio, Opelousas, Louisiana. (M. x veitchii x M. x soulangeana cv. Lennei Alba). [M. x soulangeana, M. x veitchii], cv. (Magnolia 20(1) [Issue 37]: 20, 1984). ‘A fast growing Gresham hybrid with reddish-lavender wide open flowers up to 10 inches across, with 9 broad tepals. Reddish stamens and gynoecium. White inner surface of tepals have faint pink highlights.’ Registered by Ken Durio, Opelousas, Louisiana. (M. x veitchii x M. x soulangeana cv. Rustica Rubra). [M. liliiflora, M. x veitchii], cv. (Callaway, Dorothy J. The World of Magnolias, p. 225, 1994). ‘...Todd Gresham, Santa Cruz, California, made this cross in 1964 between two of his hybrids using ‘Rouged Alabaster’ as the seed parent. 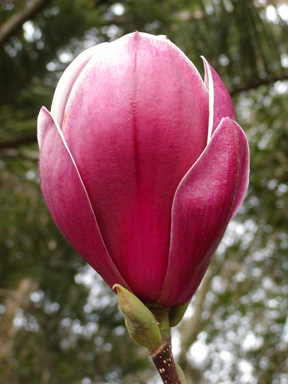 Flowers are dark purple in bud and lighter in color when open, with 12 tepals. The outer 4 tepals are reflexed at anthesis, red-purple outside and lighter toward the tips. The inside of the tepals is a translucent white. The inner 8 tepals are held erect. 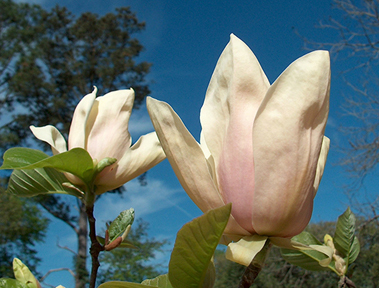 Selected after Gresham's death from hybrids he sent to Tom Dodd Nurseries, Semmes, Alabama. 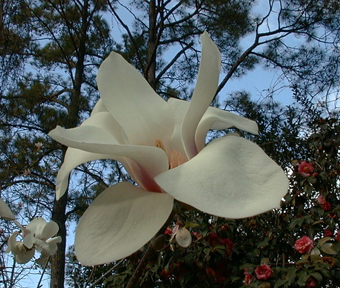 Named by Bill Dodd in 1986 and registered by John Allen Smith, Magnolia Nursery, Chunchula, Alabama, in 1991. This was the forty-ninth cross made by Gresham in 1964.’ (M. cv. Rouged Alabaster x M. cv. Royal Crown). [M. x soulangeana], cv. 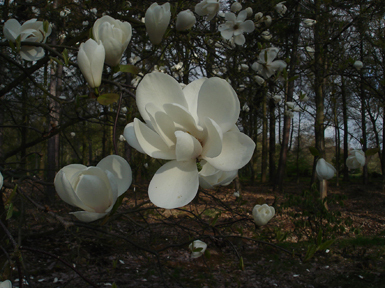 (Gardiner, J. M. Magnolias, pp. 40-41, 1989). Nomen nudum. Color photo. [M. grandiflora], cv. (Le Bon Jardinier 1833: 734. 1833); Seringe, Fl. Jard. 3: 226 (1849); Leroy, Cat. p. 65 (1856), nomen nudum. in Leroy, Cat. p. 79 (1873), leaves tomentose. in Pampanini, Bull. Soc. Tosc. Ort.41: 106 (1916), leaves ovate-elongate, red-brown lanuginose-tomentose beneath. [M. liliiflora 'Nigra' x (M. x soulangeana 'San Jose') cv. 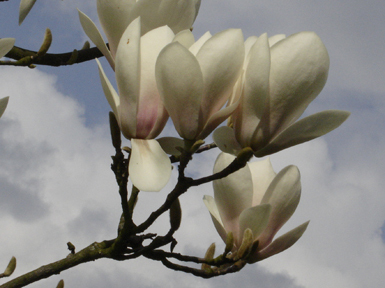 (Magnolia 40(1) [Issue 77]: 20, 2005) Flowers of this hybrid have a light, fruity fragrance and are a rich antique purple (RHS 70A) blending into a light purple (RHS 74C), with distinctive creamy-white tepal margins; inner tepal surfaces are creamy-white (RHS 155D) with wine-purple (RHS 71) staining at base; flowers typically have nine tepals forming a goblet shape; tepals 12cm (4.7in) long and 6.8cm (2.7in) wide; habit is upright and multi-branched; estimated height at maturity is 6-8m (20-26ft); predicted hardy to USDA zone 7 (possibly 6); originated at Duncan & Davies Nurseries of New Plymouth, Taranaki, New Zealand; selected and named by Vance Hooper, registered on September 12, 2004 by Jim Rumbal. [M. campbellii], cv. (Treseder’s Nurseries Catalog, p, 1, circa 1965, Truro, Cornwall, England), ‘bears large flowers of a delicate shade of pink.’ possibly = cv. Handsome Gift. [M. campbellii, M. sargentiana], cv. (Magnolia 20(1) [Issue 37]: 20, 1984). 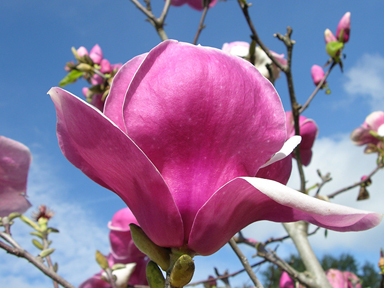 ‘A fast growing tree with flowers deep rose-pink with red-purple shading, elegant cup shape.’ (Treseder, Magnolias, P. 182). (M. sargentiana x M. campbellii). [M. campbellii], cv. (Johnstone, Asiatic Magnol., T. Opp. p, 47, 1955), not properly described, illustrated with flowers cup-shaped, very deep rose to rose-red outside, paler pink to rose-pink inside. [M. campbellii], cv. (Johnstone, Asiatic Magnol. Fig. 3 facing p. 50. 1955), not properly described, illustrated in color, flowers open nearly flat, rose-pink outside, paler pink inside which deepens towards tepal margins. [M. tripetala], var. - the typical variety. [M. umbrella], cv. (Leroy, Cat, p, 65, 1856, Angers, France), nomen nudum. in Parmentier, Bull. Sci. France & belg, 27: 253 (1896), and ‘tripelata’ (sic) on p. 336. = M. tripetala. [M. virginiana], var. (Linnaeus, Sp. Pl. 536. 1753) = M. tripetala. [M. denudata], cv. (Pampanini, Bull. Soc. Tosc. Ort.40: 213. 1915). W. B. Clarke & Co., LIST 5657, p. 39 (1956), San Jose, California, as ‘triumphant,’ described as: ‘a new form with large rose colored flowers.’ = M. x soulangeana cv. Triumphans. [M. x soulangeana], cv. (Bosse, Vollst. Handb. Blumeng., Ed. 2, 2: 467. 1841), name in Catalogs as M. triumphans; in Loudon, Hort. Brit. 584 (1850); in Koch, Hort. Dendr. 5 (1853); in Gard. Chron. II, 11: 725 (1879), nomen nudum. syn. : M. conspicua cv. Triumphans (Mouillefert, Traite 119. 1891), petals red on exterior at base and along midribs, cites cv. Grandis in synonymy. in Wyman, Arnoldia 20: 28 (1960), resembles cv. Rustica (Rubra). [M. denudata], cv. (W. B. Clarke & Co., list 5657, p. 39, 1956), ‘A new form with large rose colored flowers,’ M. x soulangeana cv. Triumphans. [M. grandiflora], cv. (Magnolia 25(1) [Issue 47]: 20, 1989). ‘One of about fifteen seedlings raised from a batch of seeds collected at the Tulsa Rose Garden in Tulsa, Oklahoma in 1974. This selection is the most vigorous and the hardiest of the lot, having been cultivated out of doors in Winchester, Massachusetts for ten years showing only minor winter injury during that time. 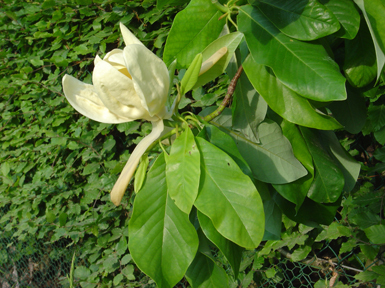 First flowers were produced in 1988, 15-20 CM. diameter.’ Registered by L. C. Case, 14 Lockeland Rd., Winchester, Massachusetts 01890. [M. denudata], var. (Schneider, Ill. Handb. Laubh. 1: 330, 1905) = M. liliiflora. [M. grandiflora], cv. (Bramati A Novara, 1865, ITALY), in Bull. Soc. Tosc. Ort.7: 318 (1882), ex Pampanini, 0p. cit. 41: 106 (1916), reflorescent, flowering without interruption. [M. kobus], cv. (Lavallee, Arbe Segrez. 8. 1877), nomen nudum. syn. : M. unicolor (Hort. ex Pampanini, Bull. Soc. Tosc. Ort, 41: 125. 1916). [M. x thompsoniana], cv. 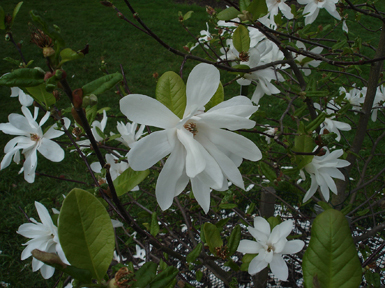 (J. C. McDaniel, Urbana, Illinois), registered 1969 from 1960 hybrid crosses of M. virginiana (deciduous) x M. tripetala. original tree stands at 2008 Cureton Drive, Urbana, Illinois. 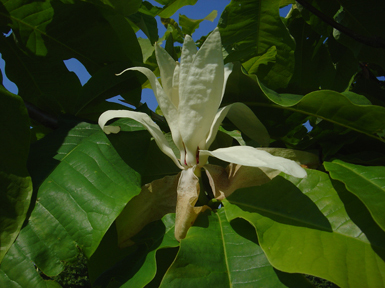 A multi-stemmed, arching shrub, leaves and flowers resemble male parent, M. tripetala; flowers fragrant, blooms mostly in June. sterile. may be propagated by leafy cuttings and grafting. uninjured by -14 degrees Fahrenheit. appears to be hardier than original thompson 1808 clone of this hybrid cross, Compare data in Illinois Research, p. 8-9, Fall 1966.